Welcome our website. We have been searching for Ivory-billed Woodpeckers, exploring potential habitat, and following-up on local reports in Louisiana since 2008. Most of the claims we examine are obvious mistakes – Pileated, Red-headed, and even Red-bellied Woodpeckers – but a handful have proven to be intriguing or better. These generally come from deep woods hunters who know Pileated Woodpeckers and ducks quite well; they may include references to little-known field marks (one observer even sketched corrections to the drawing circulated by the Louisiana Department of Wildlife and Fisheries), behavioral characteristics, observations such as “I always thought the big woodpeckers with the white backs were the males and the ones with the black backs were females”, or use of the Cajun name for the species – Poule à Marais, as opposed to Poule de Bois (Pileated Woodpecker). These credible reports have come from several locations in the state, mostly ones that are fairly remote, difficult to reach, and rarely, if ever, visited by birders. Based on our field experience, extensive research, and study of Pileated Woodpecker feeding sign outside of known Ivory-billed Woodpecker habitat, we have hypothesized that a certain category of feeding sign is beyond the physical capacity of Pileated Woodpeckers and is diagnostic. The bark scaling shown above is an example of this type of work (more about it here), and it bears a striking similarity to known Ivory-billed Woodpecker feeding sign that was photographed in the Singer Tract in the 1930s. This subject is explored in more depth in a number of posts. Also included are suggestive game camera photographs taken in 2009, 2010, and 2015, audio clips, and trip reports. The image shown above and the process used to create it are discussed here. 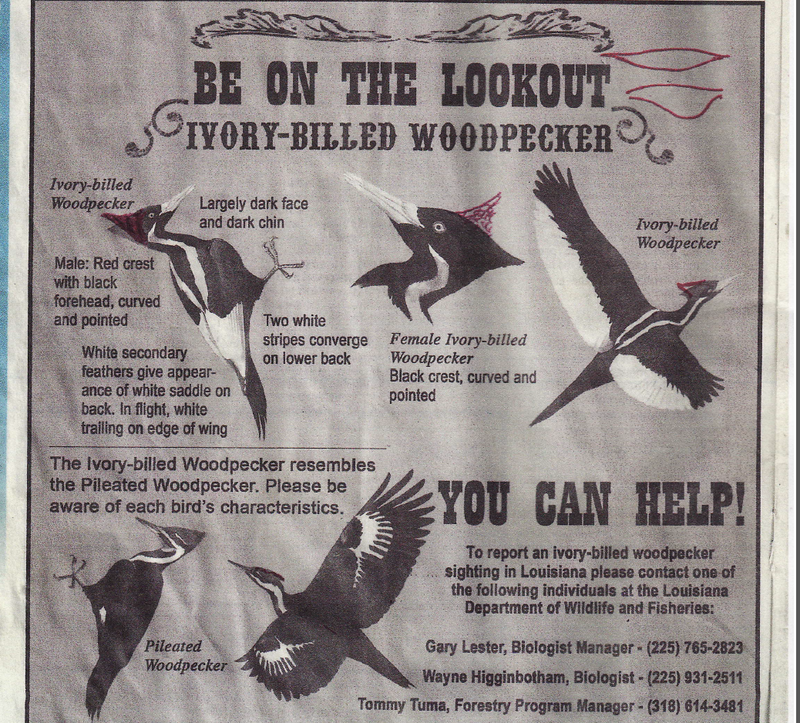 Despite our belief that the Ivory-billed Woodpecker persists in Louisiana, we are fully aware that the material we’re presenting here is not proof, however suggestive we think it may be. We hope you’ll read through the site with an open mind and return for updates. While others have given up on the species, we’re not prepared to do so. There is simply too much smoke . . . Enjoy!